Every year I take a look back on the varieties of plants we grew and how they did. Some years I’ll grow multiples varieties of one plant so I can choose the best one for our area. Other times I’ll just switch to a new variety completely to see if will work better. I’ve learned that if it’s not broken, don’t fix it. We learned this with growing corn and cucumbers in particular and are now back to just growing our tried-and-true winners. So here is my yearly list of what we’ll be growing this year and why we chose the varieties we did. Beans (Dry): Speckled Cranberry, Cherokee Trail of Tears, Anasazi. Both have done really well for us. The Speckled Cranberry beans produce large pods filled with big beans. The Cherokee Trail of Tears has smaller beans, but very long beans. We grew Anasazi beans several years ago and then, for some reason didn’t save any. These are extremely difficult to find but our neighbor from our old house found some and gave us a few to build up our seed bank with. Beans (Snap): Purple Podded Pole. Not only is the color of these beans kind of fun, but I found them to be much easier to pick (they came off really easy) and they didn’t make my arms itch. Beets: Golden. I’m generally not a fan of beets until I tried these. They are super sweet and are even good eaten raw. Brussels Sprouts: Catskill. We’ve tried these and they’ve done well. It’s tough to find open pollinated varieties. Cabbage: January King simply because I’m obsessed with this variety. Carrots: Berlicum 2. I really like these. They stay tender even when larger and so far I’ve had the best germination rates with them. They also seem to grow faster. Cauliflower: Giant of Naples. These produce nice big heads that are covered well with leaves so we don’t need to blanch them while they grow. Corn: Bloody Butcher. I love this corn. The stalks get HUGE! Usually around 12′ tall. Each stalk has 2-6 large ears of corn. The corn can be eaten young on the cob or you can let it dry for grinding and posole. It makes wonderful purple tortillas. Cucumber: Double Yield. It really lives up to it’s name with crazy amounts of cucumbers. Tom and Junior go through pickles like they are going out of style and this is probably the only cucumber that can keep up. Eggplant: Ping Tung. I like the japanese style eggplants and these seem to do well. Kale: Blue Scotch Curled. I found this variety to be less prone to aphid/mealybug infestations. Lettuce: Cimmaron – A red romaine type that I have found to be slow to bolt and doesn’t get bitter in the heat. 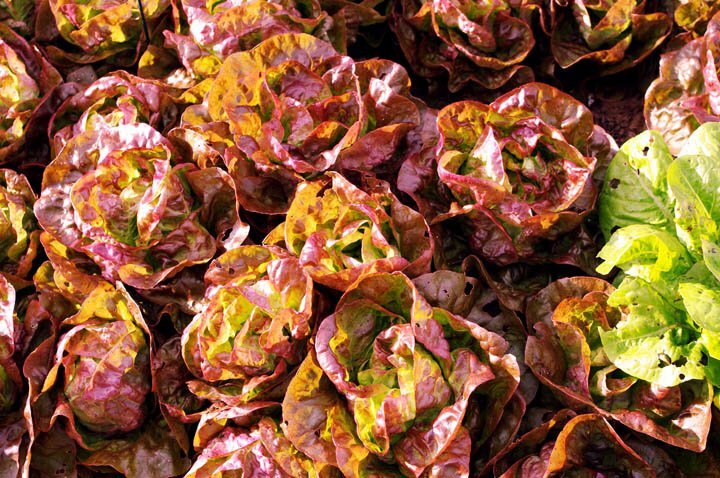 Yugoslavian Red – I’m a fan of butterhead lettuce and this one does well for us. Tango – a looseleaf variety that gets nice and big. Melon: Bidwell Casaba. This one did OK but I think it needs more heat. We’re going to try it again with black plastic this year. The reason I am trying it again though is because the flavor was so delicious. Onions (yellow): Yellow of Parma. This gives us pretty consistent bulbs as long as we keep the turkeys away from them. Peppers (Hot): Habarnero – these help tease heat out of our other peppers. Serranos – really productive pepper for us. Cayenne – another one that does well for us and has good heat. Radish: Pink Beauty. This does pretty well for us. Grows fast and produces tender bulbs. Spinach: Gigante d’Inverno. So far the best spinach I’ve been able to grow. Large, thick leaves. Hasn’t bolted on me yet. Squash (Summer): Golden Zucchini. Because of the color these were much less likely to get away from us. Squash (winter): Marina di Chioggia, Musquee de Provence. Marina di Chioggia is hands down the best tasting squash I’ve ever eaten. The flesh is dense, dry, very sweet and smooth as silk. I’ve grown Musquee de Provence in the past with fantastic results. We’re foregoing traditional pumpkins this year, so this one will be our substitute because it is so decorative, and yet great tasting. Swiss chard:Five Color Silver Beet. This one never lets us down. Tomatillos: Verde. These do really well here. Tomatoes: Hillbilly and Black Krim. These all did great last year even though it was really cold. The Hillbilly gave us tomatoes that singularly weighed over a pound. The Black Krim is a big, beautiful beefsteak type that is deep red-almost black. Watermelon: Orangeglo. Best watermelon I’ve grown so far. I’ve grown probably 5 or 6 different varieties and these are always the winners. They grow larger and sweeter than other varieties I have tried. Beans (Dry): Snow Cap. Tongue of Fire. Our friend that gave us the Anasazi beans also gave us some of these to try out. Cabbage: Perfection Drumhead Savoy. After reading this post from Erica at Northwest Edible Life, I decided to give a Savoy cabbage a go. Celery: Tendercrispl. Supposedly a very large, tender variety. Fennel: Florence. This is the bulbing kind and I want to try growing it because we’ve started eating it now. Okra: Hill Country Red. I’m generally not a fan of okra – it’s just to slimy for my tastes. However, I recently tried this pickled okra that was freaking off the hook and I’m determined to replicate it. Tom like okra too, so maybe he’ll find a way to get me to like it. This variety is supposed to be a good one for pickling. Onions (red): Bronze D’ Amposta. We need a sweet red onion that stores well. This may be one that does that. Onions (yellow): Gold Princess. We’re going to give this ciopollini type onion a try. Peas (Shelling): Tall Telephone. Another switch that we may or may not regret. I didn’t save any seed last year since most of our plants were wiped out from powdery mildew. Peas (Snap): Oregon Sugar Pod II. Same situation as the shelling peas. Peppers (sweet): King of the North. This is one that’s supposed to do well in cooler climates so I’m hoping it does well for us. Peppers (hot): Tabasco. I tried last year but didn’t get them to sprout. I’ll try them again. Craig’s Grande Jalapeno. Word has it this is actually a hot jalapeno – something I haven’t found yet. Anaheim. I’ve grown a variety of Anaheim but not the parent one. I want to give it a try. Radish: White Icicle. My grandfather used to grow these and I have fond memories of pulling them out of the ground, hosing them off and munching on them. Tomatoes: Blondkopfchen and Isis Candy – Tom wants to have some cherry tomatoes in the mix. Wapsipinicon – We tried this in Ohio. It’s a mild flavored creamy yellow tomato. The most interesting thing about this variety is that the fruit is fuzzy like a peach. Mortgage Lifter – I’ve been wanting to try this one for awhile. Kellogg’s Breakfast – Another big beefsteak variety that I’ve wanted to try. Turnips: Purple Top White. Tom loves turnips. I’m not such a fan but since I get to grow radishes he gets to grow turnips. Watermelon: Blacktail Mountain and Sweet Siberian. Both are varieties that are supposed to like cooler climates. So that’s our list. What are you growing this year?